In 2007, I visited my good friend Kristen who was living in Paris at the time (lucky girl!). One of my favorite parts of the visit was spending afternoons recharging at La Duree, a tea and pastry shop, after spending the mornings sightseeing, shopping and walking around Paris. La Duree is most well known for their delectable macarons (not to be confused with coconut macaroons). “Le macaron” is a French sweet consisting of two cookies that are hard on the outside but soft when you bite into them that are sandwiched between a layer of ganache or fruit preserves. 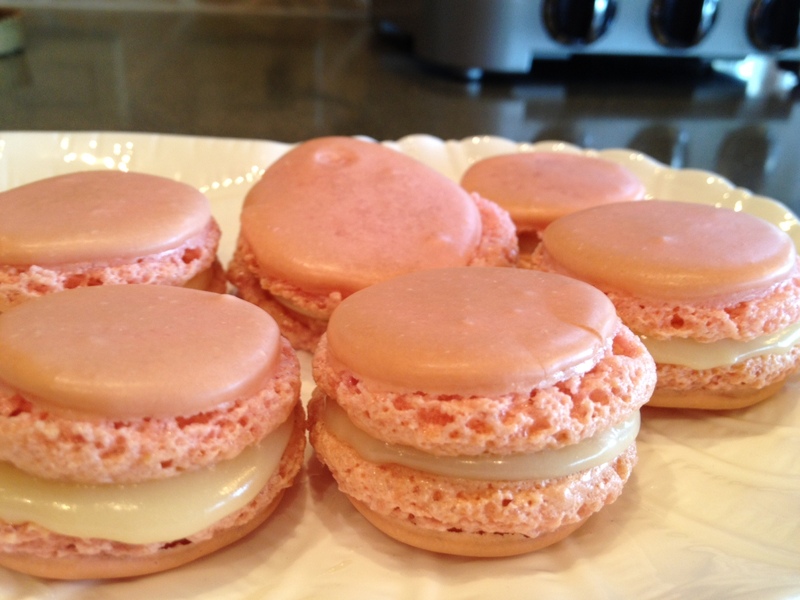 If you are interested in learning more about the history of “le macaron,” check out this website. Until a few months ago, La Duree only had stores in Europe (Paris, London, etc.) and the Middle East (Saudia Arabia, Kuwait, etc. ), so to get my macaron fix, I had to stock up when I visited Kristen or when I am in London for work. However, La Duree recently opened up a NYC-branch of their famous Parisian tea shop at 864 Madison Ave. on the Upper East Side so now I can get macarons whenever the craving strikes (which is quite often!). I always wondered how to make macarons until a few weeks ago I found a recipe for macarons from Allison Eats blog on the Word Press dashboard. You can find my adaptation of her recipe below. While I won’t be giving up La Duree macarons anytime soon, I can’t wait to serve these at Christmas dinner tomorrow with coffee or hot chocolate after dessert! If you are new to making macarons like I was, the following sites provide a useful primer on preparing macarons and how to beat egg whites. It took me two tries to get the egg white perfect. I would not recommend using an electric mixer; a copper bowl and whisk worked MUCH better. Also, as a warning, this took me the better part of a day to create these treats. Be sure you have set aside at least 3-4 hours when you tackle this recipe. For more information on French Cooking and Culture, check out this great blog – A Woman’s Paris. The watercolor iPhone cases are to die for! 1. 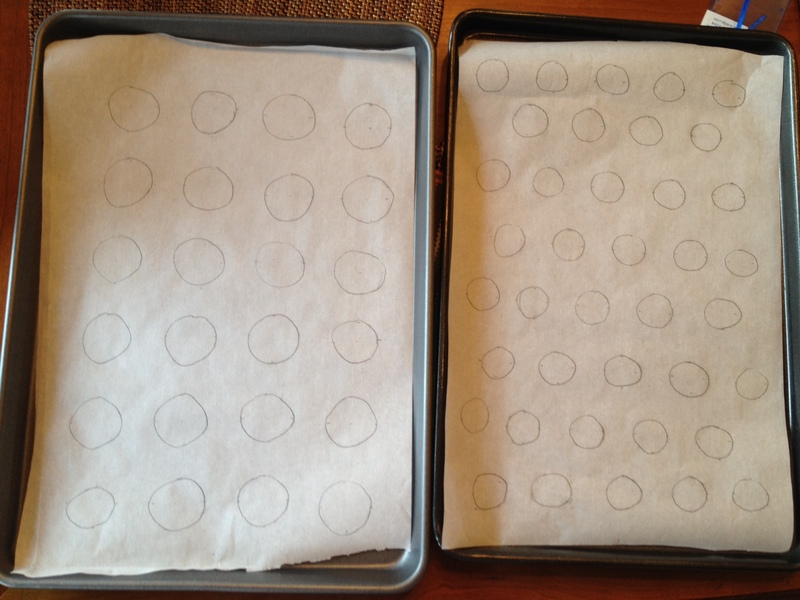 Get out 5 baking sheets and line each with parchment paper. Using a pencil, draw 1.5″ circles approximately 1″ apart on the papers. I felt silly doing this, but it really helped me get the hang of things for my first tray, so maybe only do this for a couple of trays if you are short on time. In the picture below, the right tray has 1″ circles and the left tray has 1.5″ circles. 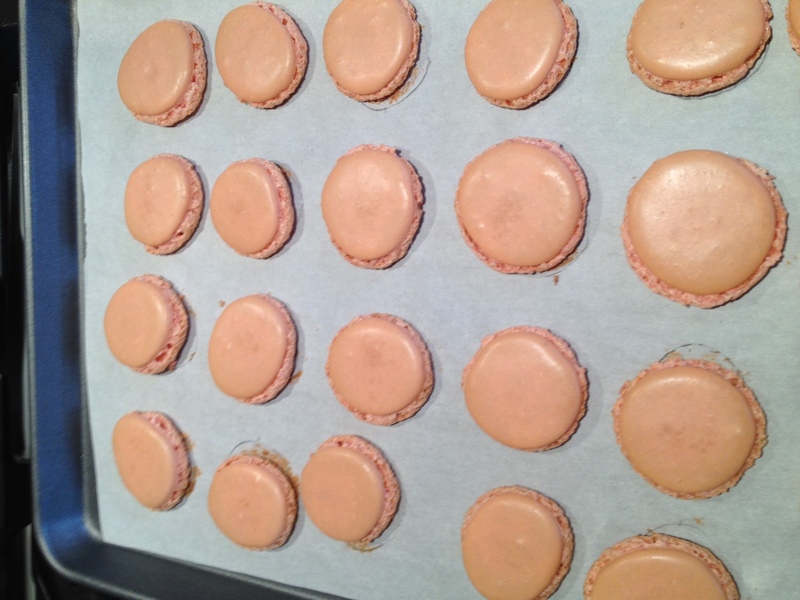 I found that the larger 1.5″ macarons cooked better and were simliar to La Duree’s mini macarons in size. 2. In a food processor, blend the almond flour and powdered sugar until well incorporated and no lumps remain. 3. In a copper bowl, beat egg whites using a whisk until they are foamy. 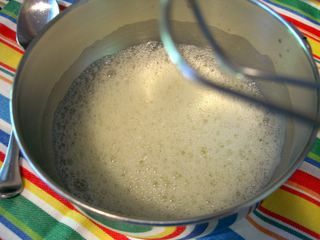 When they are foamy, add a pinch of cream of tartar and continue beating. Gradually add in the granulated sugar about a tablespoon at a time. Once the egg whites have formed “soft peaks,” add the peppermint extract and 30 drops of red food coloring. (I added 20 drops of food coloring to my mix and I think it could have used a little more.) Note: It is important that the egg whites are room temperature as this helps the “peaks” form in the egg whites. The cream of tartar also helps this so don’t forget this step! 4. Using a rubber spatula, carefully fold the flour/sugar mixture into the egg white mixture in a few additions. Blend each time until well incorporated. 5. Fill pastry bag (or big ziploc bag with approximately 1/2″ cut off on a diagonal) with the batter and carefully dispense into your drawn circles. Once the tray is filled, rap the baking sheet on the counter to help settle the batter. Let trays sit out at room temperature for at least 15 minutes so that a slight crust forms on each shell. Note: Letting the shells sit at room temperature before baking is a crucial step. This is how you obtain the crunchy on the outside/chewy on the inside French macaron texture. 6. While the shells are sitting, preheat the oven to 375 degrees. Bake ONE tray at a time for 9-12 minutes, until the shells are slightly crisp on top. Remove from oven and allow to cool before removing from trays. (To me, they look the the image from the Scrubbing Bubbles ads when they are finished.) Repeat process one tray at a time until all trays are cooked. 7. 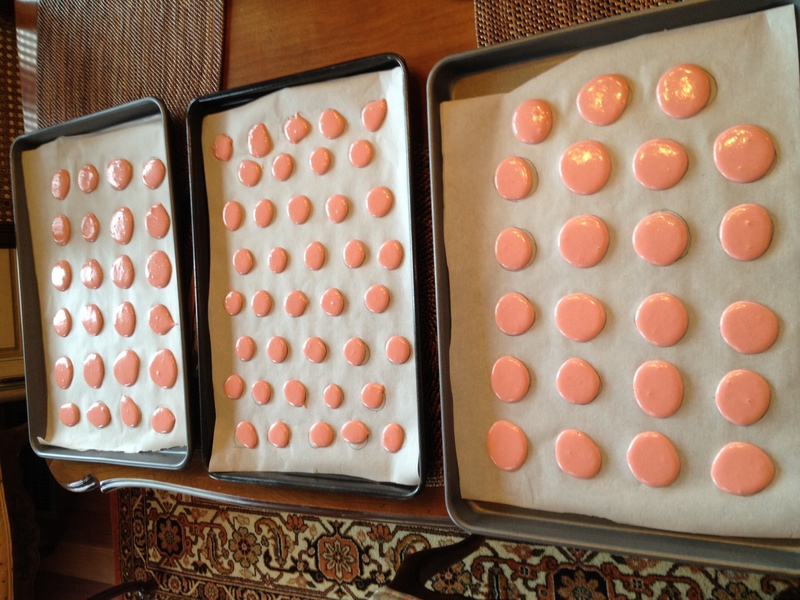 Once the macarons have cooled, pair each shell with one of similar size and shape. For each pair, flip one over so they are ready to be filled with the ganache. 1. Put the white chocolate in a heat proof mixing bowl. 2. In a small saucepan, bring the cream to a boil. Immediately remove from the heat and pour over the chocolate. 3. 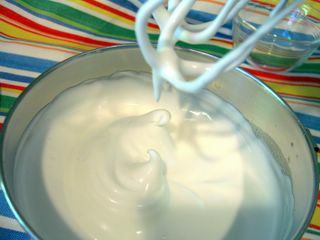 Using a whisk or rubber spatula, stir ingredients together until smooth. Then stir in the butter. 4. Place the bowl over a larger bowl filled with ice water, stirring constantly until ganache is thick and won’t run. 5. Place ganache into pastry bag (or Ziploc bag with 1/2″ opening cut on diagonal at one end). Work quickly so the ganache doesn’t harden. Carefully pipe filling onto flat side of one shell, leaving space around the edges. Pick up the filled shell’s empty pair and place it on top of the filled shell, gently twisting as you press them together. 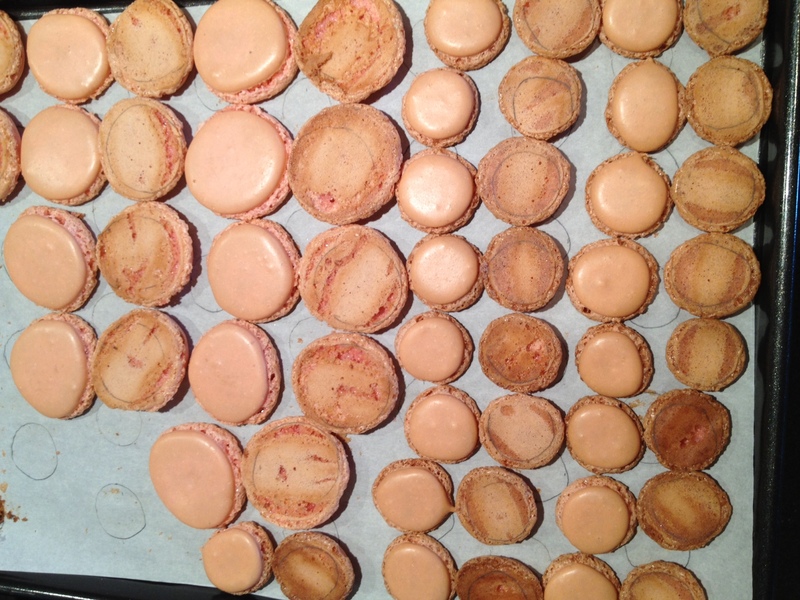 Once all macarons have been filled, store in the refrigerator. They are best enjoyed the following day when brought to room temperature. Merry Christmas everyone! Best wishes for a happy holiday and a blessed new year!